The Universe is full of a lot of interesting and fascinating things. We are always discovering new things about it. Its immense size will always keep us curious. This is because the possibility of finding new things is nearly infinite due to the universe's size. We are just scratching the surface in regards to space exploration and scanning the cosmos. There is still a lot to learn. Well, recently we were visited by an asteroid from another solar system. It is possibly the first object in space that is not native to our own solar system. This fact alone is interesting but there is another fact that has astronomers surprised. This asteroid is extremely strange. 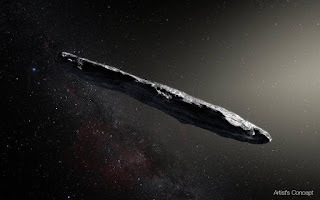 It is cigar-shaped and traveling extremely fast at about 85,000 miles per hour and is 124 million miles away from the Earth. The asteroid is rocky and has a reddish hue. Scientists named it "Oumuamua." The word is Hawaiian and means "A messenger from afar arriving first." Scientists are trying to learn as much about it as possible. However, it will not be in our solar system for long. It is scheduled to pass by Jupiter in May of next year, Saturn in 2019 and eventually leave our solar system and travel to the constellation of Pegasus. Studying this asteroid may give us more information about other systems and how they formed. It may also have clues as to whether life exists elsewhere in the universe.